Hi Everyone! Candace and Michelle here.. before we get to today's post we wanted to make an announcement. We have asked Mel to stay on as a permanent design team member and she agreed, and we're so excited! So you will be seeing a lot more of Mel right here on the JB Blog! Welcome Mel! We're almost through our 2013 Guest Designers, so if you would like to be a guest designer in 2014, pay close attention to the blog in November. We will be having a guest designer team call. Hello Everyone! It is Mel with my first post as an "official" designer for Jaded Blossom. Beware.. I am the guest that doesn't leave. Seriously, I am so happy to join the Jaded Blossom Team and look forward to making projects with their creative products. 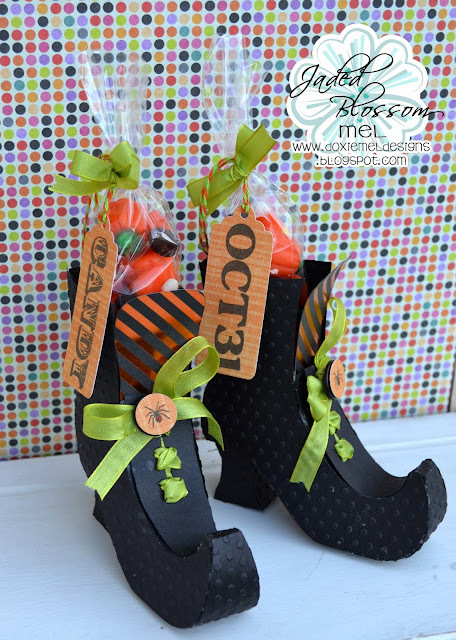 Today I have some "witch boots" filled with treats. All the stamps on this project are from the Halloween Bingo stamp set. The words are perfect for the treat tags and I even used a spider stamp to decorate the bow. The boot file was found at the Silhouette online store, 3d witches boot. Congrats on your DT position! You have been making some pretty fabulous projects - can't wait to see more! Congratulations Mel!!!! Loved all your projects as Guest DT. The boots are awesome...can't wait to see what you have in store for us in the coming months!!! Congratulatios that is so awesome! !Great project!! Fabulous Boots! I think they might juts fit me..LOL! YAYY!!! so happy to have you, Mel!! Love these shoes too!! great project! Congratulations! Love your witches boots.. super cute. Mel, these are AWESOME! And YEA for DT Call!! I'll be watching!! Those Boots are Awesome. Congrats on making the Team!! !